United States President Donald Trump played host to President Muhammadu Buhari at the White House Monday, telling the Nigerian president that the persistent wanton killings of Christians in Nigeria was a serious problem, which must not be allowed to continue. Buhari, who arrived Washington on Sunday for a four-day visit to the U.S., was received by Trump at midday at the White House and ushered into the Oval Office, where both leaders exchanged pleasantries before proceeding to a closed-door meeting for talks bordering on the war against global terrorism and trade. Buhari was the first leader from sub-Saharan Africa to visit Trump when he arrived at the White House. As they opened discussions in the Oval Office, Trump said it was important to meet face-to-face, â€œespecially on terrorism and terrorism-relatedâ€ issues. â€œWe have a very big trade deal weâ€™re working on for military equipment, helicopters and the like,â€ Trump added. Trump also told Buhari that the protracted killings of Christians in the country was unacceptable and required working very hard to put paid to it, adding that having met Buhari before, a great relationship was being developed. â€œWe had met before, developing great relationship. We look forward to our discussions today (yesterday). They are very important but again, especially as it relates to terrorism. That is terrorism here and terrorism all over the world. â€œItâ€™s a hot bird and we are going to be stopping them. Also, we have had a very serious problem with Christians who are being murdered, killed in Nigeria. We are going to be working on that problem, and working on that problem very, very hard because we canâ€™t allow that to happen. Mr. President thank you for being here, thank you,â€ Trump said while receiving Buhari. Responding, Buhari thanked the U.S. President for inviting him. He also thanked him for agreeing to sell 12 Tucano aircraft to Nigeria and expressed further appreciation to Trump for the physical involvement of the U.S. military in the fight against terrorism in Nigeria through training of Nigerian forces. Buhari blamed the heinous killings being perpetrated by Fulani herdsmen on the movement of militants from Libya following the death of its former leader, Muammar Gaddafi, saying the militants had proficient skills in shooting and killing. 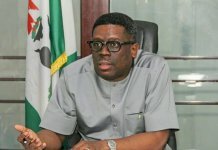 He said whereas herdsmen in Nigeria were hitherto known for carrying only sticks, and machetes to cut grass for their herds, they are now armed with AK47 rifles, explaining that efforts were being made to stop cross-border movement and check the proliferation of arms in the West African sub-region. Furthermore, he said the effective operations of the U.S., which he noted had largely incapacitated ISIS, had also helped to weaken Boko Haram which had pledged its loyalty to ISIS. â€œThank you Mr. President for inviting me. Itâ€™s a great honour. I am very grateful for it. Certainly, security is the main issue. We are very grateful to the United States for agreeing to give us the aircraft we asked for and the spare parts. â€œWe are even more grateful for the physical presence of the United States military instructors that go into our institutions and train them, and go to the warfront in the North-east to see how they are performing as a result of the training given to them. â€œThe commitment of the United States to get rid of terrorism across the world, we have had first-hand experience of that and we are very grateful for it. â€œThe problem of the cattle rearers and herders in Nigeria is a very long historical thing. Nigerian herdsmen never carried anything more than a stick and occasionally, a machete to cut down foliage and give it to their animals. â€œThese ones are carrying AK47 (rifles). So, I donâ€™t think people should underrate what happened in Libya. In the 43 years of Gadaffi, people were recruited from the Sahel. They were thought nothing other than shooting and killing. â€œWith the demise of Gadaffi, they moved to their countries and their regions and they carried away with them the only experience they had and their training using weapons. And that is what is aggravating the situation. â€œWe are doing our best to ensure that we stop cross-border movement and so on and to ensure that the proliferation of small arms in the region is checked. â€œBut it is going to take time, and the action by the United States in trying to see the end of ISIS has helped us a lot because Boko Haram in Nigeria at one time made a statement that they were loyal to ISIS. â€œAnd now that ISIS has virtually gone with the help of the United States, we are very grateful for that and we are sure that we are stabilising the situation of security in Nigeria,â€ Buhari submitted. Trump, who echoed Buhari that ISIS had been decimated, noted that the story had not been the same with Boko Haram which he said had been terrible, as he proceeded to ask Buhari what he was doing about the Chibok and Dapchi girls who are still in captivity. â€œWe have very much decimated ISIS. Much has taken place over the last 12 months but Boko Haram has been terrible and how did you do with the young women that were kidnapped? How was that going?â€ Trump asked Buhari. Responding, the Nigerian president said the kidnap of the Chibok girls took place before his administration but added that about 130 had been brought back. Buhari also said of the 105 Dapchi girls who were kidnapped last February, 100 of them had been released, four of them died, while one was still in captivity. Thanking the United Nations (UN) for its roles in the release of the kidnapped girls, Buhari said efforts were still being made to secure the release of the remaining girls in captivity. â€œThe Chibok girls kidnap was before we came in 2014. We have only a number of them, we recovered about 130 of them. But the Dapchi ones, they were 105 that were kidnapped. We got 100 back, four died, one is still held in captivity and we are very grateful to the United Nations that is acting in between us and the kidnappers and we havenâ€™t given up. â€œWe are trying to get everybody back to join their families and their schools,â€ Buhari said. After the closed-door meeting between the Nigerian and U.S. delegation, Trump and Buhari held a joint press briefing at the Rose Garden of the White House, where the American president said he was honoured to host Buhari in the White House, saying Nigeria is the largest democracy in Africa. Trump noted that he had conveyed to Buhari during their discussions that the U.S. â€œdeeply values and appreciates Nigeriaâ€™s role as a strong democratic leader in the regionâ€. He added: â€œThe United States is working to expand trade and commercial ties with African nations, including Nigeria, to create jobs and wealth in all of our countries. â€œWe hope to be the economic partner of choice for nations across the continent and all around the world, and I hope you see what is happening all around the world with respect to trade and the United States â€“ we are being respected again. â€œI hope all African countries and countries throughout the world that we also will be supporting you and that they would likewise support us in our bid along with Mexico and Canada for the 2026 World Cup. We will be watching very closely and any help they can give us in that bid, we will appreciate it. â€œI am pleased that Nigeria is one of our largest trading partners in the region, and we look forward to growing our trade based on the principle of fairness and reciprocity. â€œBut we give Nigeria well over $1 billion in aid every year and we have already started talking with the president about taking down the trade barriers, very substantial barriers in the United States trading with Nigeria, so we think that we are owed that. According to the U.S. president, the elimination of trade barriers would make it easier for Nigerian and U.S companies to invest, adding that American companies would do so substantially once a level playing field is created. 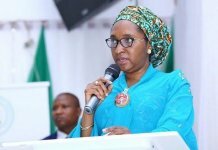 â€œThese measures will make it easier for Nigeria and U.S. companies to invest and we will be investing substantially if they can create a level playing field. â€œI also want to thank President Buhari in the partnership and leadership in the fight against terrorism â€“ he has been a real leader. Nigeria was one of the first countries to join the coalition to defeat the Islamic State (ISIS) and Nigerian forces are currently leading the regional effort against ISIS in West Africa and doing very well as we have. â€œNigeria is also leading the effort in the fight against Boko Haram, another ruthless jihadist terrorist group â€“ you have been reading about them, they kidnapped the young girls and young women, many of whom we have never seen again. â€œThis summer, it was my honour to meet with two brave young women, Joy Bishara and Ledia Pogu, who were kidnapped by Boko Haram in April 2014 in a secondary school in Nigeria. I was deeply moved by their stories of courage, resilience and survival. â€œI told the two girls my administration is committed to combating the scourge of kidnapping and human trafficking and smuggling. In the world today, there are more human traffickers and slavery than at any time in human history. â€œWe are helping Nigeria by facilitating training and providing military equipment to the Nigerian forces. For example, we recently sold Nigeria 12 A29 Super Tucano aircraft in the first ever sale of American military equipment to Nigeria. â€œWe are deeply concerned by the religious violence in Nigeria, especially the burning of churches, the killing and persecution of Christians â€“ it is a horrible story. â€œWe encourage Nigeria, the federal, state and local leaders to do everything in their power to immediately secure the affected communities and the innocent civilians of all, including Muslims and Christians,â€ Trump added. While thanking Buhari for the visit, he described Nigeria as a valued partner, stressing that he looked forward to deepening Nigeria-U.S. cooperation and forging an even closer partnership. The U.S., Trump added, was committed to working with Nigeria as it seeks a future of strength, prosperity and peace for both countries. In his response, Buhari pointed out that both countries share a long history of cordial relations, which encompasses political, economic, military, social and cultural cooperation. Both countries, Buhari added, maintain a strategic partnership for peace and security, conflict resolution as well as the global fight against terrorism. Buhari disclosed that the two delegations, during their interaction, discussed security, trade, governance, human rights and the humanitarian crisis in the North-east. â€œPresident Trump, his team, myself and the Nigerian team discussed issues relating to security, trade, governance, human rights and the humanitarian crisis. â€œWe congratulated the leaders of North and South Korea on their historic summit and we applaud them for the positive commitment they have made for the denuclearization of the Korean Peninsula. President Trump deserves the credit for the state-manly role he played in transforming so dramatically the courses of events in that region. â€œWe also congratulated the U.S. for the important role it played in the defeat of the Islamic State, although some of their remnants have found their way to the Sahel region,â€ Buhari said. Nigeria, Buhari stressed, recognised the strong role the U.S. is playing in the countryâ€™s (Nigeria) fight against terrorism and the agreement to sell 12 A29 Tucano aircraft to Nigeria to effectively fight terrorism. 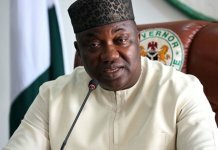 To defeat terrorism in Nigeria, he said the federal government has adopted a multi-sectoral approach involving the relevant government agencies in addressing the social and political dimensions, while the Armed Forces of Nigeria assist the civil authority to provide security and maintain law and order. â€œAs part of efforts to address emerging cases of insurgency in the country, the Nigerian military adopted a non-kinetic counter terrorism/counter insurgency approach code-named â€˜Operation Safe Corridorâ€™, to de-radicalise, rehabilitate, and reintegrate willingly surrendered Boko-Haram members into the larger society. â€œThis programme is currently embarking on a number of projects including skills acquisition centres and integrated farms, comprising poultry, fish pond and greenhouse farming, among others. A number of international partners, including the International Organisation for Migration have contributed to the success of Operation Safe Corridor. We indicated that we would appreciate whatever support we could also get from the U.S,” he said. He disclosed that the U.S. to date has been the biggest contributor to the humanitarian response, â€œand last year gave $500 million in cash and kind through the United Nations and other inter-governmental-organisationsâ€. He said his government was doing what it could to secure the release of the remaining abducted schoolgirls from Dapchi and Chibok. Buhari also hailed the Trump administration for its laudable decision to launch a Kleptocracy Asset Recovery Initiative to assist in achieving that aim and implored the U.S. to sustain its cooperation with Nigeria to effectively achieve this objective. â€œWe thanked the U.S. government very much for the cooperation we have received in our effort to recover stolen funds. 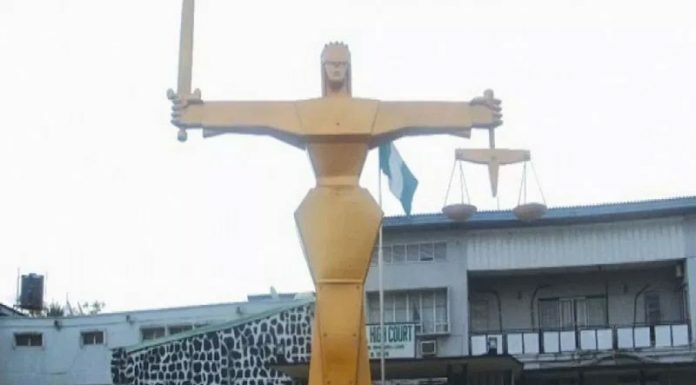 Our two governments have put the machinery in place for their respective Attorneys-General to collaborate in ensuring the return to Nigeria of $500 million looted funds siphoned away in banks around the world. â€œIn this connection, we congratulated the U.S. government on the launch of the Kleptocracy Asset Recovery Initiative which was spearheaded by the U.S. Department of Justice (DOJ) Asset Forfeiture and Money Laundering. We hope that we could continue to count on U.S. support in this area,â€ he said. On the economy, Buhari congratulated â€‹both Trump and his government on what he described â€œas the impressive performance of the US economy under their watchâ€, disclosing that Nigeriaâ€™s focus was on diversifying its economy by focusing on agriculture and food security as well as power and infrastructure. The Nigerian president who also said 2016 statistics showed that Nigeriaâ€™s trade volume with the U.S. stood at $6.07 billion, observed that the figure comprised $4.176 billion worth of Nigerian exports to the U.S. and $1.894 billion U.S. exports to Nigeria. He said both presidents sought greater efforts to increase these figures substantially. Buhari added: â€œWe have cut the importation of rice by about 90 per cent, thereby saving a significant amount of money. We very much welcome increased U.S. investment in the Nigerian economy, especially in the non-oil sector. â€œEconomic relations between Nigeria and the United States are anchored on three major instruments, namely: the Bi-National Commission (BNC), Trade and Investment Framework Agreement (TIFA) and the Africa Growth and Opportunity Act (AGOA). After reading their prepared speeches, both leaders took questions from the press, during which Trump described Nigeria as an amazing country that he would like to visit. â€œI would like to visit Nigeria, it is an amazing country, and in certain ways, I hear from the standpoint of the beauty of a country, there is no country more beautiful,â€ Trump said. Buhari also disclosed that both Nigeria and the U.S. had put the machinery in place for the repatriation of $500 million stolen funds to the country. On corruption and efforts by the Nigerian government to secure the U.S.â€™ assistance in the repatriation of looted funds, Trump acknowledged that Nigeria has a reputation for massive corruption, but added that the U.S. will continue to offer its support for Nigeria to proffer a lasting solution to the menace. He also said that his Nigerian counterpart had done a lot to combat corruption significantly in the country. â€œIn terms of corruption, Nigeria has a reputation for very massive corruption, but I also know that the president has been able to cut that down very substantially, we talked about it, and they have made a lot of progress,â€ Trump said. Asked whether he was offended by Trumpâ€™s alleged denigration of African countries in the past, especially the use of a vulgar term to describe African countries, Buhari tactfully replied that he was sceptical about media reports and would rather not comment on them. â€œI am being careful about what the press says about others and myself. 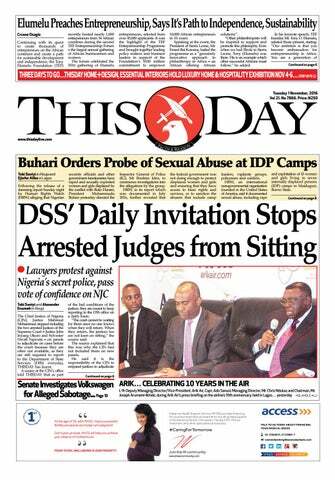 But the best thing for me to do is to keep quiet,â€ Buhari said. Buhari said his government had done a lot to curb human rights abuses in Nigeria, especially in the ongoing war against Boko Haram. â€œThe government of Nigeria remains committed to human rights, even in the course of fighting terrorism,â€ he said. When Buhari was asked if he had any issues with the role of the U.S. as the policeman of the world, he said that he had no problem with the presence of American troops in Nigeria, adding they were only in the country to offer training and other support that are crucial to winning the war against terrorism. â€œThis is one of the best things the United States could do for our country,â€ Buhari said. Trump at this point interjected, saying Buhariâ€™s comments were fair, but added that he would want to see America scale back its supervisory role across the world while improving trade with other countries. â€œWe want to police our country. What we want to do now is to open Nigeria and other countries to trade,â€ he said. On the concerns about the low patronage of Nigerian crude by the U.S. in recent years, Buhari said he would not tell another country what to do. He praised the U.S. for its technological innovations that had helped to reduce its reliance on oil. â€œI canâ€™t tell the U.S. what to do. Luckily for us, we have got a market for our crude oil. But the progress made by the US in technology is certainly frightening for our mono-economy. â€œI hope technology will allow them to use our crude for its quality for petrochemicals,â€ the Nigerian president said. The U.S. president further clarified that Nigeria was interested in agricultural produce from his country, stating that plans were in place to allow exports of U.S. farm produce to Nigeria â€” â€œfor the good of U.S. farmers, Nigeria, and Africaâ€. â€œWhat we discussed today was our agricultural products going into Nigeria, which Nigeria wants. But we have certain barriers that donâ€™t allow that to happen. â€œFor the good of U.S. farmers and for the good of all of Africa, it is very important that we are able to send our agriculture produce into Nigeria and we would be working on that right away,â€ Trump said. Also responding to a question on Nigeriaâ€™s purchase of military aircraft from the U.S. for the fight against terrorism, as well as the need to get the aircraft delivered quickly to Nigeria, Trump said denying Nigeria the purchase of war planes before now was not good, stressing that his government sold the best aircraft in the world to Nigeria. â€œWe love helicopters, but he (Buhari) likes them more than I do. He likes buying helicopters and they buy a lot of helicopters. So, very soon we are getting them the planes. â€œPart of the problem is that before you werenâ€™t allowed to buy helicopters in your country, but now you are. I worked that out. So, now you can buy the helicopters that you want. â€œThe helicopters we have here are the best in the world. We make the best military equipment in the world and our friends can now buy those equipment. â€œWe are also helping our Nigerian partners by facilitating intelligence, cooperation and providing training and military equipment to the Nigerian forces. For example, we recently sold to Nigeria 12 US A-29 Super Tucano aircraft, great aircraft, in the first ever sale of American military equipment to Nigeria. â€œThis new aircraft will improve Nigeriaâ€™s ability to target terrorists and protect civilians,â€ Trump said. Reacting shortly after the joint briefing by both leaders, the opposition Peoples Democratic Party (PDP) Monday bemoaned the performance of the Nigerian president during the meeting with his U.S. counterpart, describing it as embarrassing and disturbing. The party lamented that Buhari completely failed to project the economic interests of the country before the American government and the world. A statement issued by its National Publicity Secretary Kola Ologbondiyan said it was alarming that Buhari buckled during the bilateral negotiations and failed to address the issue of the drop in U.S. purchase of Nigeria’s crude oil, saying it is the main stay of the Nigerian economy. â€œNigerians and the business community were aghast when President Buhari could not market our crude oil to his American counterpart even when in the course of the question and answer session, a leeway was provided for him, he off-handedly declared that he cannot â€˜tell America what to doâ€™,â€ the party said. 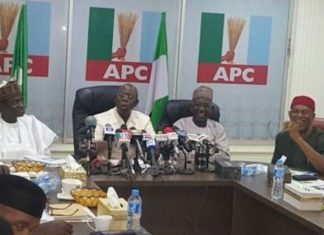 PDP also said that Buhari had no answers to Trumpâ€™s stance that the U.S. had not been investing substantially in Nigeria owing to the unconducive economic climate under his administration, further confirming the stand of the PDP that the All Progressives Congress (APC) was running a moribund economy. More disturbing, PDP noted, was the revelation by Trump that the U.S. has been supporting Nigeria with the sum of $1 billion annually whereas Buhari, in his script, announced that Nigeria received only $500 million last year. â€œWe had expected President Buhari, as the â€˜African Champion on Anti-Corruptionâ€™, to immediately respond to President Trump on the whereabouts of the shortfall of $500 million. â€œIt is also inexcusable that President Buhari had no answers to the security situation of daily bloodletting and mass killings in Nigeria, which President Trump described as â€˜horribleâ€™. Instead, he restricted himself to his script, which was silent on the issue. â€œBy this, the American government has summarily indicted President Buhariâ€™s government on its failure to ensure security of lives and property of Nigerian citizens. â€œOn the whole, the visit surmises photo-ops of President Buhari in the White House in a bilateral session where President Trump was committed to marketing the U.S. to the most populous black nation,â€ the PDP said.